As part of our Founders Day Celebrations, and in recognition of our 15th Anniversary, some of our Staff Members share their Top 15 Moments on TheOneRing.net (in one case just their Top Moment on TORn). I thought we’d start with Tehanu’s Top 15 Moments on TORn. 2. Early trips to scope out and photograph the Hobbiton area, with various friends, including the time we tried to access the farm via the forested hills behind it. 3. When a LOTR fan with a Cessna emailed to say he’d seen the Hobbiton set from the air, and would we like to take a flight with him for another look? And bring a camera? 4. Going up Mt Ruapehu (Mt Doom) with Thorongil when he visited NZ. We just happened to see the “Jamb” signs that pointed crew to locations, and drove up – and were stopped not by security guards but by a UK film journalist who seemed to know who I was by sight (how was that even possible? I hadn’t been in the media or put my photo online anywhere). He’d been trying to get past the security cordon to photograph some filming – the Battle of the Last Alliance. We couldn’t help him, but went on up to the skifield where we could see some filming from a distance. The film crew broke for lunch, and everyone threw blankets over their costumes so we couldn’t get a good look as they trooped past us for lunch. Hugo Weaving walked right past us but we couldn’t quite figure out the familiar face. 5. Meeting Peter Jackson and the cast and crew on the Hobbiton set. 8. The ROTK Oscars party, where we all got to celebrate the 13 Oscars with our friends and with the amazing people who had made the film. 9. The LOTR wrap party – with the bloopers reel. 10. Hiking all over NZ to look at and photograph things around the production. 11. Every time we found something quirky and fun that we could put on TORN and give wider circulation – like the Secret Diaries, or Figwit, or Lord of the Peeps, or a score of other brilliant creative things that people all over the world came up with. Some of them went viral. 12. Every time a TORN reader thanked us for making them aware that there was a whole world of people who shared their interests and took them from loneliness and isolation to feeling like part of a community. There were some amazing stories over the years from people who had found, in Tolkien and the TORN community, the strength to live in ways that were more true to themselves, often in a new place or in a new career. 13. Every time I finished a Tehanu’s Notes column and Calisuri turned it into a beautiful page, and it’d go live. Loved reading the responses from readers. 14. When Barliman’s first opened. First time I posted – back early in 2002, I found the website and just jumped right in, without ever declaring myself a newbie. Thus I avoided being crunched by Karen the Magnificent – which was the standard newbie greeting at the time! Attending the marriage of Roheryn and NZ Strider, who met through TORn. That was a fabulous weekend; such a happy occasion, and a wonderful gathering of TORnsibs. Any time TORnadoes gather is a time of celebration! Meeting up with TORsibs in Edinburgh, going to see Flight of the Conchords in the Edinburgh Festival, and then climbing Arthur’s Seat with Roheryn, Bret McKenzie and Jemaine Clement. Making the transition from the old message boards to the new ones; the new ones were such an improvement, but it still felt kind of sad to say goodbye to the boards which had been ‘home’. I remembering lingering there, when the move had been made but the old boards were still accessible, and finding that grammaboodawg was still there too; a dear friend in a special place. MANY Fiesta Fridays – I don’t make it to the boards for those very often anymore, but it used to be a high point of my week! I’d make sure to drop by each Friday, and catch up with friends. Glass of bubbly please, barkeep! MapMoot in Chicago, 2007 – joining ‘sibs to see the special ‘Maps – Finding our place in the World’ exhibition at The Field Museum. This exhibition included some of the Professor’s hand drawn maps; it was such a treat to see them, and of course a great weekend with TORnadoes! Going to New Zealand in 2006, and catching up with TORn friends there. I’ve spent time with TORnsibs in America, in Europe, and in New Zealand – and it’s always far too short a time to spend with such excellent and admirable people. There have been lots of exciting interview moments – flying to Toronto to meet Richard Armitage; flying to London to cover the AUJ Home Video release press junket; freezing on the red carpet in London for AUJ; helping to coordinate the ‘Fan Event’ in NYC November 2013; have phone conversations with many wonderful cast members… Time spent with LotR/Hobbit cast is always good. DragonCon is a highlight every year since I first went along (which was I think 2005?) So much fun in one crazy weekend: meeting fellow fans when they come by our table; the Evening at Bree with Emerald Rose always being fabulous; seeing wonderful costumes; spending time with dear friends, whom I only see once a year at the con! Last year’s ‘Middle-earth goes 80s’ dance party deserves a special mention; that was a night to remember indeed! Awesome – can’t wait for the 70s dance party this year! Becoming TORn staff in 2007 – and Senior Staff a few years after that. It’s an honour to be a part of this community – even if it does eat up more of my time than I should probably allow… Proud to be a small part of the best website out there – Happy Birthday TORn! The April Fool where we put it about that New Line had bought us. Favorite TORn Con moment: Helping out as a staffer at Comic-Con in 2011. Most nerve-racking moment as a staffer of TORn: Seeing my first article posted hoping I didn’t sound like a complete idiot. 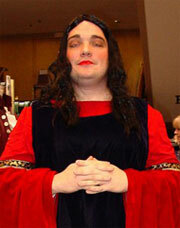 Funniest moment: Seeing Chris at ORC as Charwen. Things I love: Like Cathy I love our readers and their passion for Tolkien. I know my passion and so its amazing seeing that there are so many that feel the way I do. I also love all my fellow staffers. You all have made me feel so welcomed and being around people all the time (virtually) that love sharing everything we can is fantastic. Best thing about TORn: We bring you the news that covers all corners of Middle-earth. Best News Story: I should say stories of all the behind the scenes stuff from all five Middle-earth movies so far. It all makes you feel as if you were actually on set. Fan Reaction: I love reading the reactions to my reviews. Even if people don’t agree with me I love reading why they feel like I wasn’t right. 1) That first Oscar party. Others were more successful, but the first one was an unknown for us, 5 sleepless weeks turned into a smashing success. 2) The ROTK Oscar party, cause yeah, 11 Oscar wins and two dozen Oscars on our stage at one time, they didn’t want to leave our party for other more official parties because the energy level was so high. Getting labeled as one of the hottest Oscar parties in the LA Times the next day was icing on the cake. 3) The first ORC, Again, treading unfamiliar waters with hosting a convention, especially one as ambitious as this one. With the actors on one stage, an Art Show, Screening room, two Academic tracks, a costuming track and programming for children. Another smashing success, but it didn’t have to be. ChrisArwen was the highlight though. 4) The Bagginses Birthday Bash at Griffith Park, all of them actually. I do love this event, it is just good geeky fun. Who says geeks never go out of doors? 5) Late night gatherings afterhours at the Conventions and Oscar parties with both staff and TORnsibs. Always fun to see what happens at 3am after a full day. 6) Line Party fun, especially during the first trilogy. Hosting and posting images from parties all over the world really helped bring the community together. 7) The #VoteBilbo campaign, something very unexpected, but I still tweet with many of the folks I bumped into on Twitter then, really helped galvanize the newer generation of Tolkien fans. 8) Hall of Fire Chats, don’t get to many, but they are always so much fun. 9) TORn Tuesdays, again, I don’t get to many, but they are always a lot of fun. 10) The TORn/Red Carpet Tours’ Premiere party in Wellington just before the World Premiere of The Hobbit: An Unexpected Journey. It was fun hanging with some of the Kiwi staff, and the party had a really great vibe to it. 11) Some of our April Fool’s posts have been outstanding, both in terms of how well they fooled the readers and in how they fooled other press outlets who reposted our stories. Yes, they can be frustrating to some readers when they realize they were duped, but it is a long internet tradition we take part in alongside some heavyweights online. 12) Our readers, I really love their passion and joy and even their fiercely held opinions, and I love meeting them at parties, conventions, at the movies, and sometimes behind the counter at a fast food restaurant. We use the phrase TORnsib for a reason, we are all family. 13) The Radio City Music Hall concerts for FOTR and TTT, we had a pub moot beforehand, we included a trip to see Fellowship! The Musical and then we got to experience the joy of the soundtrack music performed live to the film screening. 14) Seeing Ringers: Lord of the Fans on the big screen at the Newport Beach Film Festival, with Billy Boyd sitting right behind me. We had a line party and costume contest before the film, which was full of cast and crew of the films, special guest fans, and then all of us regular fans. 15) My fellow Staffers, so many good friendships that will last a lifetime, so many memories, including that last convention we had with Balin as his health faded. Favorite TORn Convention moment: Leading the “PETER” chant at the 2004 Oscars Party. Most surreal moment 2: Meeting and getting autographs from LotR cast & crew. Favorite news scoop: It’s a trilogy! Do you have a Favourite 15 Moments of TORn? Share them with us on our Message boards, Facebook Page, Twitter or via disqus, we’d love to hear what they are. Thank you to everyone who visits here, whether you’ve been a regular from the beginning back in 1999 or more recently, you all make this such a fun job to do. Here’s to another 15 fun years of TORn! And many, many more!